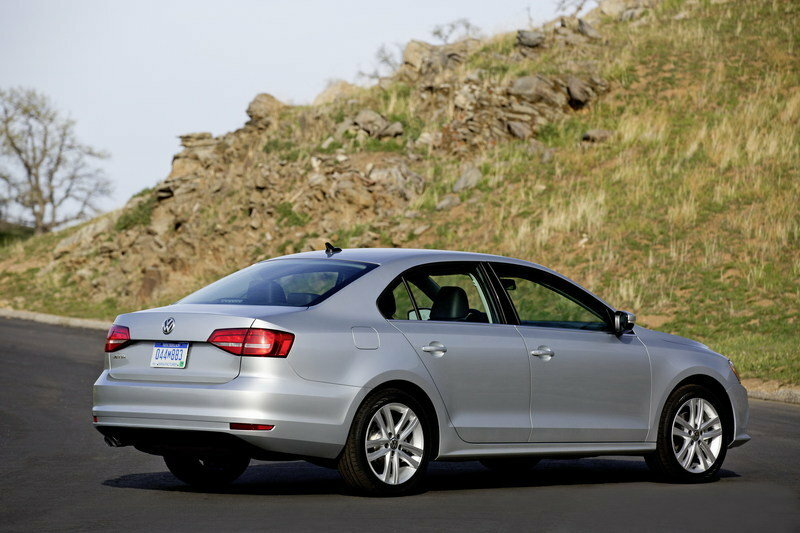 The success of the Volkswagen Jetta is unquestioned. After all, it doesn’t earn the distinction of being VW’s best-selling vehicle for nothing. That being said, it’s a little disappointing that the 2015 Jetta, which is set to make its debut at the New York Auto Show, didn’t receive as many upgrades as we had anticipated. But hey, Volkswagen seems to think that the modifications it did put in are enough to continue the Jetta’s path as its breadwinner. It’s hard to argue on that front considering that the variety of Jetta models that are likely to be offered in the market will run the gamut of customer preferences. Be it an entry-level Jetta, or the diesel-sipping Jetta TDI, this Volkswagen sedan is as versatile as they come in the business. Oh, and it’s got a workhorse GLI model, too, just in case you’re looking for one that has 200 horsepower under its hood. 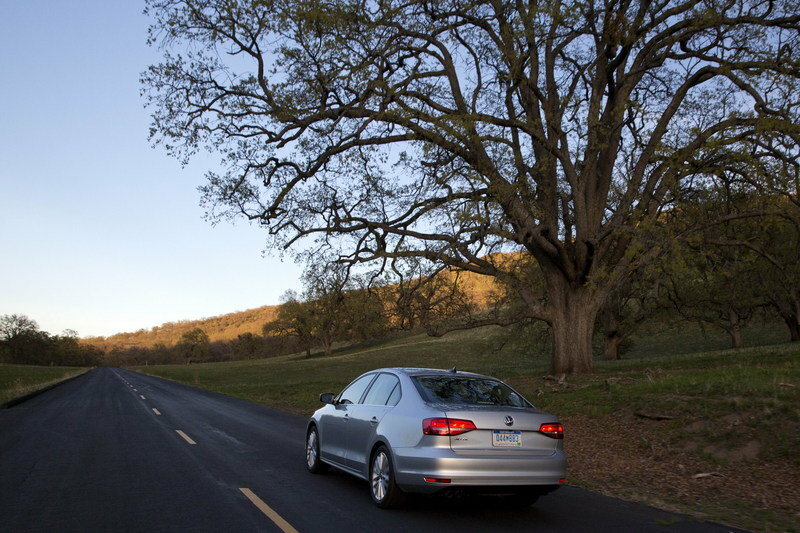 Click past the jump to read more about the 2015 Volkswagen Jetta. A new headlight setup is also in store for the 2015 Jetta, which now includes optional xenon headlights with LED running lights, arranged in an L-shaped string alongside and beneath the xenon modules. 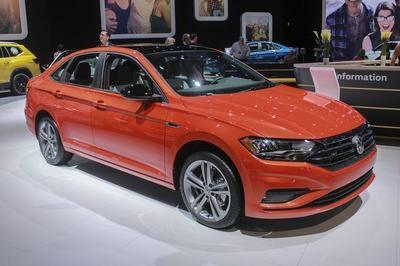 One look at the 2015 Jetta and you’re probably wondering whether Volkswagen changed the exterior at all. Well, the short answer is "yes." But the changes are mostly limited to subtle tweaks, ones that are barely visible if you don’t really take a close look at it. Fortunately, we did look closer at the new Jetta, and we did notice a few changes, including a few aerodynamic changes on the front fascia and the trunk lid. Some modifications on the sill covers are also on tap, as are the new wheel spoilers and an underbody panel that you can find covering the rear axle. 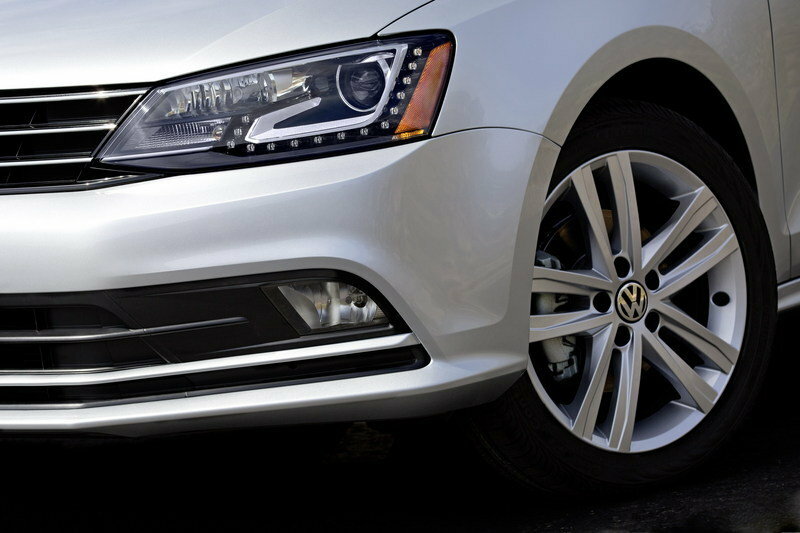 The Jetta also gets a larger lower air inlet and re-sculpted fog lights mounted in the outer areas of the bumper. Obviously, Volkswagen wanted to decrease the aerodynamic drag on the Jetta’s body, and it seems to have succeeded. The side lines of the trunk lid on the rear section now run downward, marking one of the more significant changes to the model. Volkswagen also redesigned the VW logo on the Jetta, although it doesn’t really make that much of a difference. A new headlight setup is also in store for the 2015 Jetta, which now includes optional xenon headlights with LED running lights, arranged in an L-shaped string alongside and beneath the xenon modules. the front grille is also modded to include three cross fins. LEDs also make an appearance on the taillights of the GLI and Hybrid models. 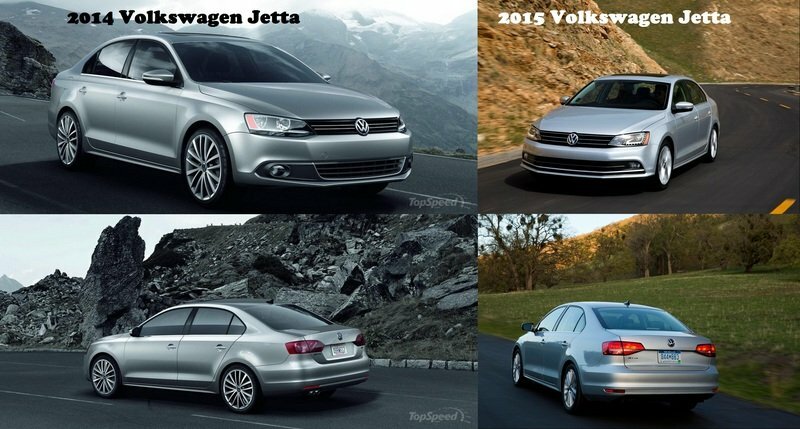 Other than these changes that we noticed, the 2015 Jetta still looks like, well, a Jetta. Volkswagen add in some modifications on mid-and high-level trims, including dash gauges that have been framed in chrome-edged tubes, with an available color multifunction display in between. Following in the same vein as the subtle exterior changes, the interior of the 2015 Jetta gets its own subtle upgrades. 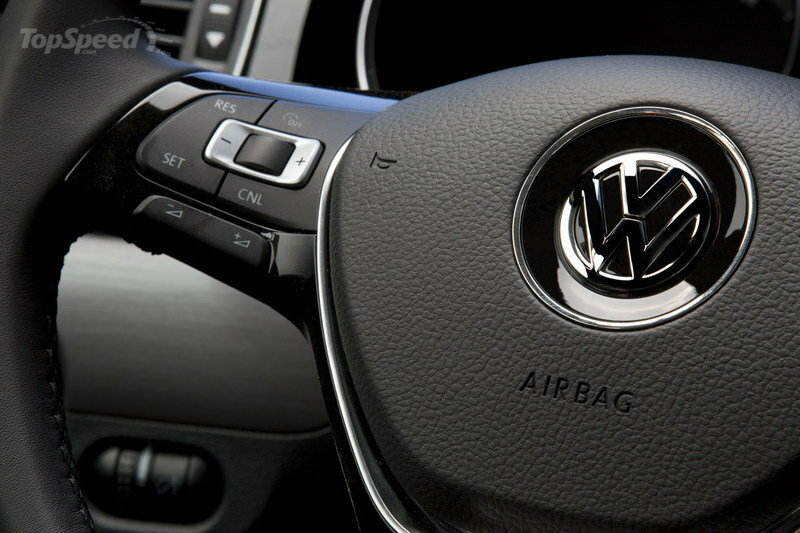 While the overall look remains largely the same, Volkswagen add in some modifications on mid-and high-level trims, including dash gauges that have been framed in chrome-edged tubes, with an available color multifunction display in between. Some options like a a new multifunction steering wheel redesigned air vent controls; piano black accents on the center console are also on the docket. But the biggest difference are the multitude of tech features. 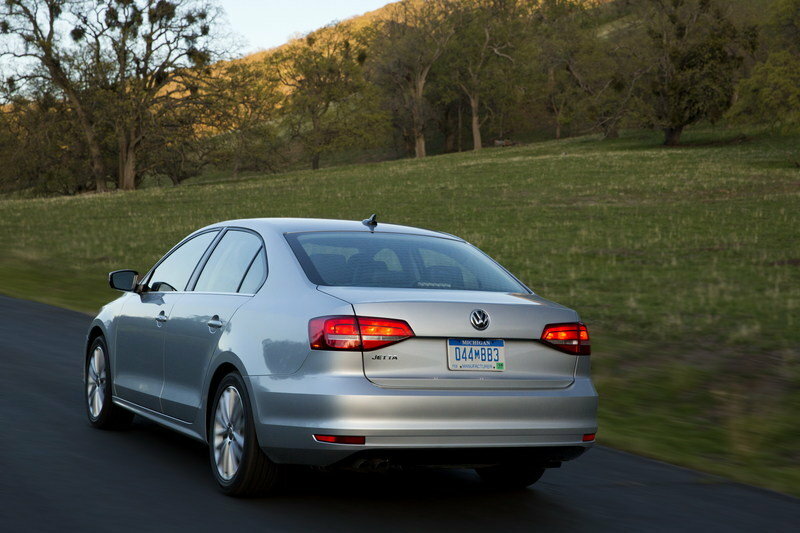 The 2015 Jetta now has Blind Spot Detection, which helps improve driver awareness when changing lanes. An equally new rear cross-traffic alert assistance system has also been added to serve as a complement to the Blind Spot Detection system, helping the driver to see stationary and moving vehicles directly behind the vehicle. The 2015 Jetta still has a variety of engines, including the 1.8-liter turbocharged four-cylinder that produces 170 horsepower and 184 pound-feet of torque. The biggest change, though, lies in the new, 2.0-liter TDI engine that has improved its efficiency rating to 45 mpg on the highway, 3 mpg more than the 2014 model. 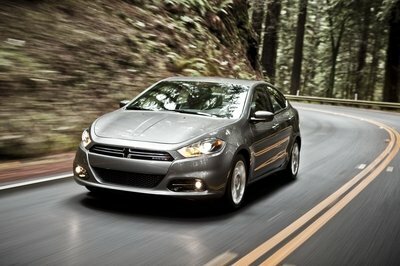 It did all of that while still returning the same 140 horsepower and 236 pound-feet of torque. Other engine options include the top-of-the-line 2.0-liter turbocharged inline-four for the Jetta GLI with 210 horsepower and 207 pound-feet of torque on tap. Volkswagen hasn’t released pricing for the new wave of Jettas, but expect it to range from $18,000 for the entry-level model all the way to $30,000 for the loaded trims. It’s not a coincidence that on the same auto show where Volkswagen is showing off the 2015 Jetta, one of its chief rivals, the Cruze is also being presented in all of its 2015 guise. 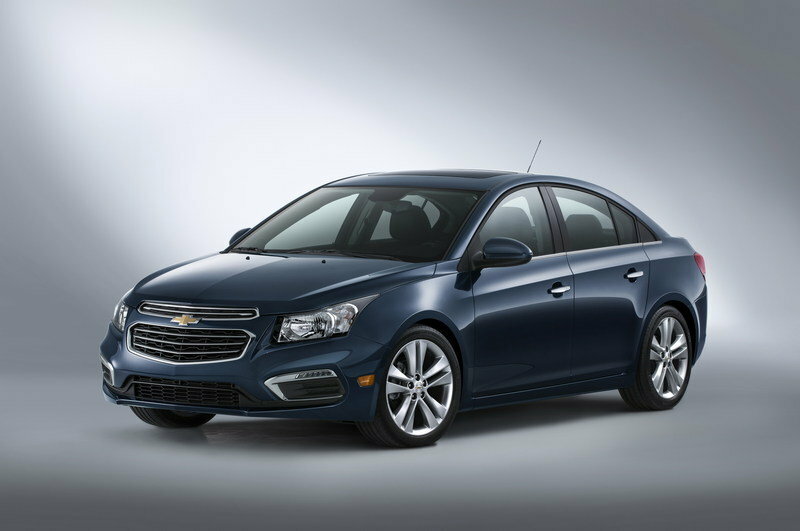 Unlike the Jetta, the new Cruze looks significantly better than its own predecessor, which can be attributed to the changes done on the front of the sedan. On top of that, the Jetta TDI’s biggest adversary, the Cruze Diesel, also saw its own upgrades, including an improved efficiency rating of 47 mpg on the highway. That’s a little more than what the 45 mpg Volkswagen is promising for the TDI. The price difference between the two models shouldn’t be too large. 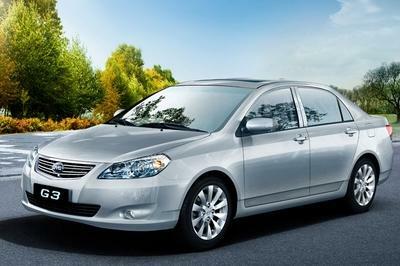 Any mention of a mainstream compact sedan will always have the Toyota Corolla as one of the first cars. It doesn’t help rival models like the Jetta that the Corolla received a full redesign last year, complete with a dramatically improved exterior styling, and a fancier interior with plenty of character expressed in decent materials with good fit and finish. 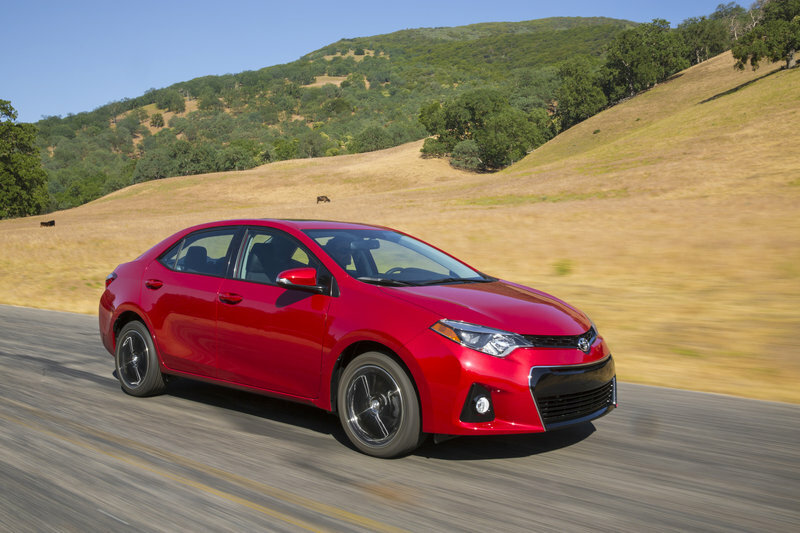 The 2014 Corolla also has a 1.8-liter, in-line four engine that produce a steady 140 horsepower through either a six-speed manual transmission or a CVT. Starting price for the Corolla is $16,800 and grows to $21,300, which is a little less than what an entry-level Jetta will cost you. Given what Volkswagen had to work with on the Jetta, it’s a little surprising that it didn’t give it a more significant refresh. But the company is likely confident that even with all the additions that it did put into the Jetta, it’s going to translate into the same success that the model has had in the U.S. 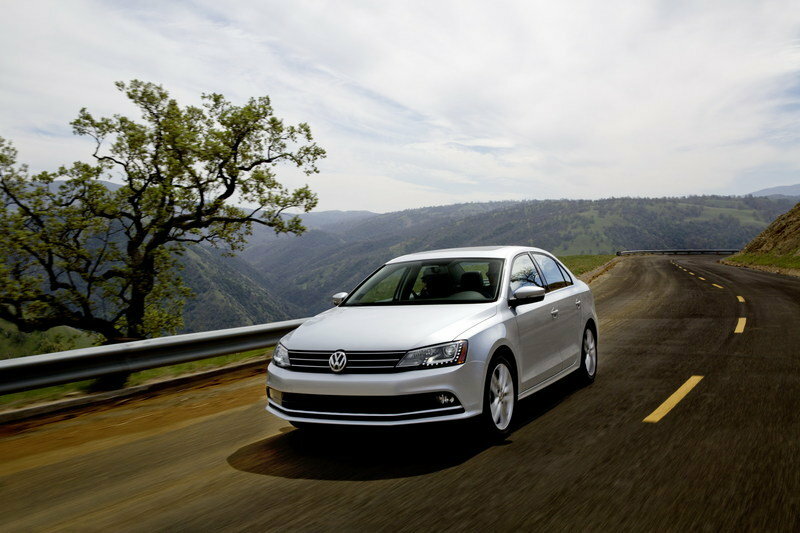 The variety of the Jetta is undoubtedly its biggest strength with seemingly a model suited for just about everybody. 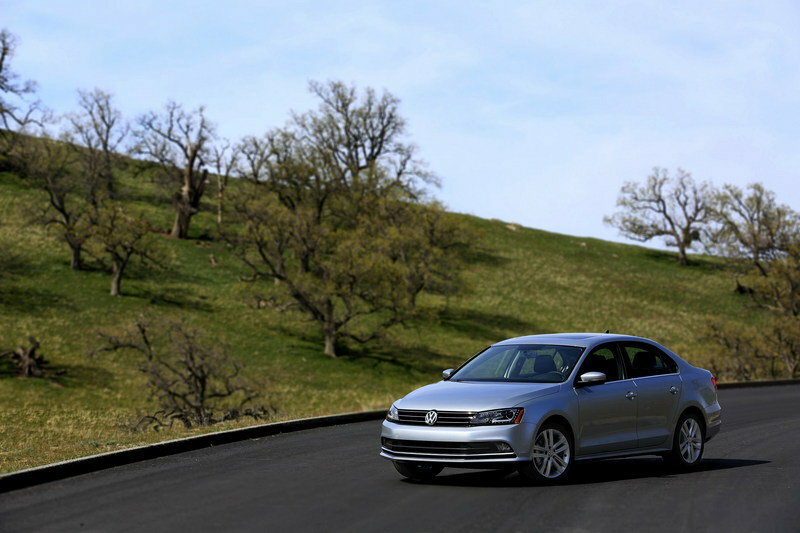 Whether you’re a young driver looking for your first affordable ride or you’re an eco-friendly adult, the Volkswagen Jetta has a model you can proudly enjoy. 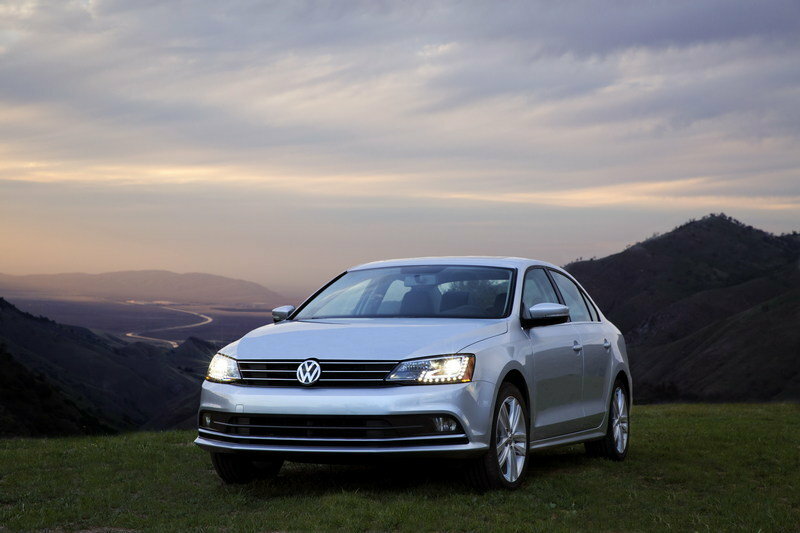 Is Volkswagen sitting on its laurels with the Jetta? On top of being Volkswagen of America’s number one-selling car for decades, the Jetta is one of the world’s most successful sedans with more than 14 million units sold since 1979. Last year alone, Volkswagen delivered 925,000 units worldwide—making the Jetta the top-selling car for both the brand and of the entire VW Group. Now, at the 2014 New York International Auto Show, Volkswagen is presenting the world premiere of the redesigned 2015 Jetta sedan. 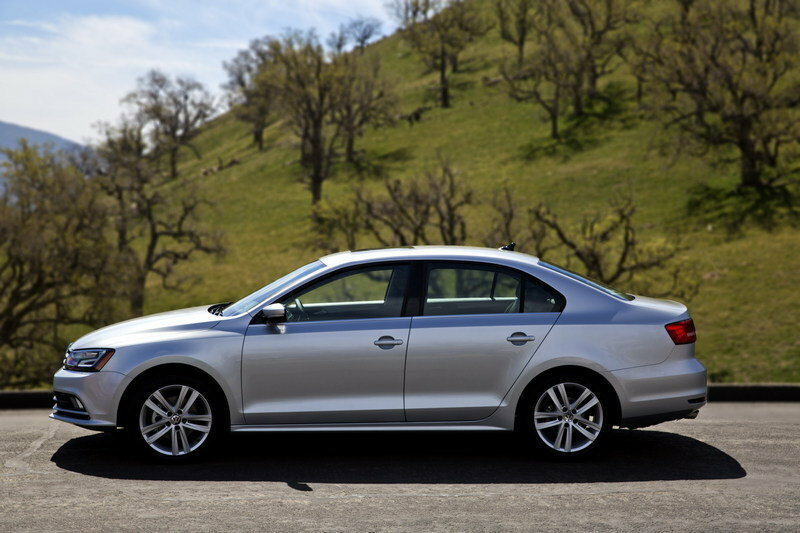 In addition to new styling touches at the front and rear of the car, the 2015 Jetta has notable changes throughout. Overall efficiency has been improved by reducing air drag and utilizing new tires that help improve rolling resistance. New driver assistance systems are available, such as Blind Spot Detection, frontal collision warning and rear cross-traffic alert. 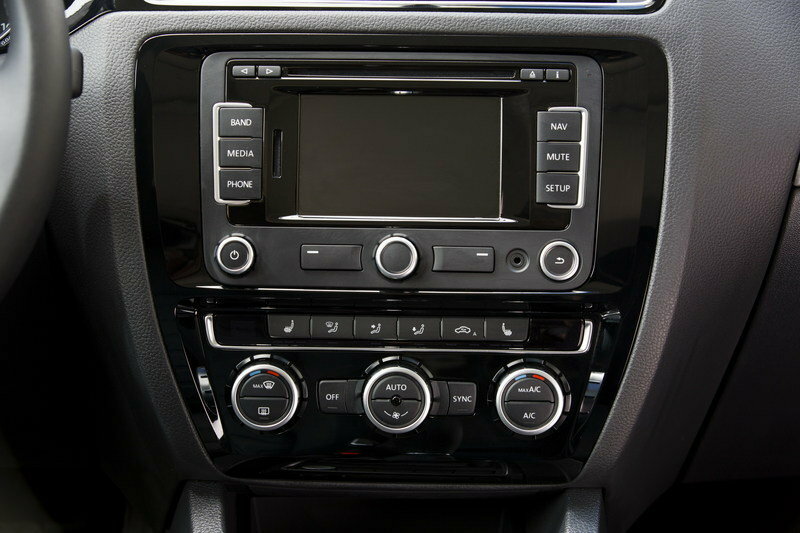 Inside, the Jetta sees an upgraded interior with new materials and an enriched assortment of available equipment. The 2015 Jetta continues to offer three four-cylinder gasoline engines (2.0-liter naturally aspirated and 1.8T and 2.0T TSI® Gen 3 turbocharged EA888 engines), a 1.4-liter turbocharged full hybrid version, and a new EA288 2.0-liter turbocharged EA288 TDI Clean Diesel engine. 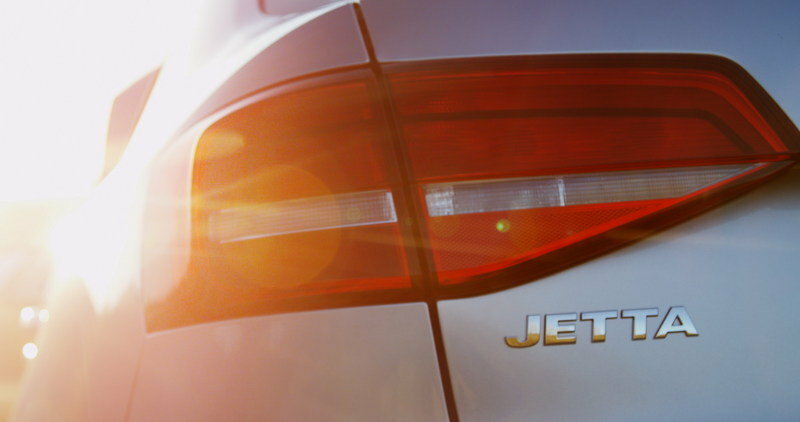 Furthermore, the 2015 Jetta has been engineered to meet or exceed all current U.S. safety standards. 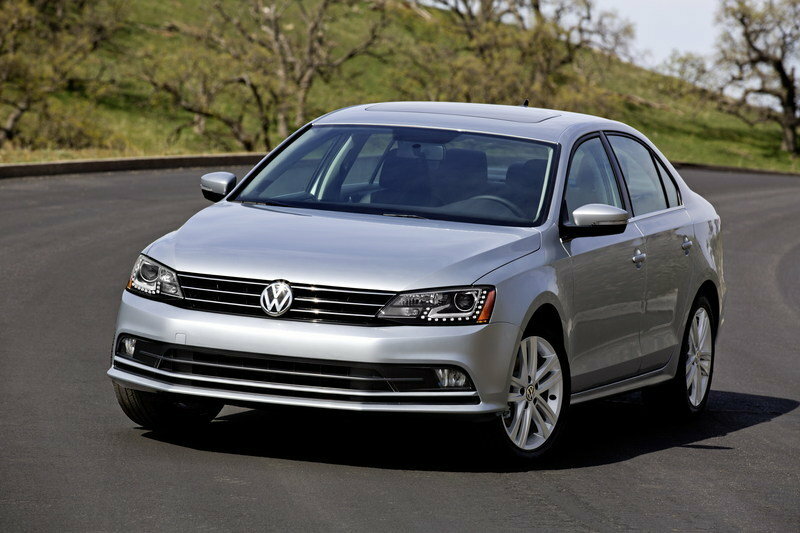 The 2015 Volkswagen Jetta is expected to arrive at U.S. Volkswagen dealers in the third quarter of 2014. Volkswagen has restyled the front and rear of the Jetta while improving its aerodynamic properties. 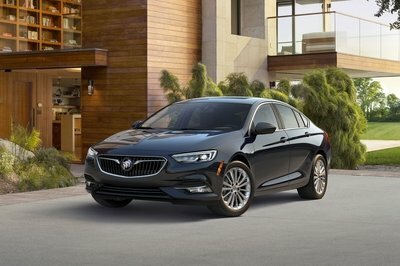 At the front, the latest generation of the car can be recognized by its redesigned radiator grille with three cross fins, optional Bi-Xenon headlights with Adaptive Front-lighting System (AFS), and a new bumper. The Bi-Xenon headlights have an especially distinctive design: Each daytime running light is formed by 15 LEDs arranged in an L-shaped string alongside and beneath the xenon modules, creating an unmistakable light signature, day and night. 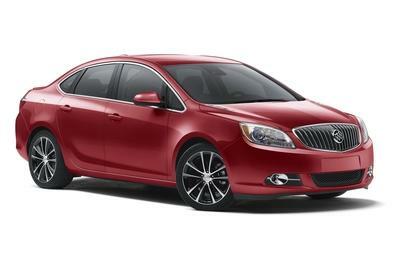 A chrome element between the LED daytime running lights and the xenons accentuates the headlights. The new visual band formed by the radiator grille and the headlights, as well as the now larger lower air inlet, give the Jetta a wider and more substantial look. Re-sculpted foglights mounted in the outer areas of the bumper reinforce this effect. New rear design. The trunklid, taillights, rear logos and bumper of the Jetta have also been updated for 2015. The trunklid has an aerodynamic trailing edge, and on the sides the lines of this integrated spoiler extend into the rear fenders and then into the precise contour of the car’s silhouette near the so-called character line. Beneath this are new available LED taillights (GLI and Hybrid only) which feature a bright stripe, as well as a redesigned VW logo. One level lower, the side lines of the trunklid now run downward, which dominates the design. The new bumper underneath it all completes the new rear look of the Jetta. Optimized aerodynamics. Volkswagen has introduced numerous innovative aerodynamic modifications into the design and equipment of the Jetta. In the front of the car, air drag has been reduced by the new bumper, optimized air intakes, and aerodynamically refined rain gutters on the sides near the A-pillars. A closer look reveals underbody panels at the rear axle and sill covers with wheel spoilers. Jetta models equipped with the 1.8T engine also have modified brake ventilation channels. Jetta GLI and Jetta Hybrid models sport special aerodynamic elements such as new front/rear spoilers and sill extensions. Dynamic radiator shutter. One new aerodynamic feature on the Jetta TDI 1.8T and 2.0 TDI Clean Diesel is a closeable shutter for the radiator grille. Closing the radiator shutter helps shorten the warm-up phase of the engine due to reduced air cooling. If the engine coolant temperature drops below a predefined temperature threshold while driving, the radiator shutter remains shut. Once the engine moves beyond the warm-up phase, the shutter can open and close based on vehicle speed and cooling demands. When closed, frontal airflow is guided around the body, which helps to improve the car’s aerodynamics and thus reduces fuel consumption. Updates to the Jetta’s interior are subtle but significant. On mid- and high-level trims, the dash gauges can now framed in chrome-edged tubes, with an available color multifunction display nestled in between. Elsewhere, the 2015 Jetta sports several optional new features based on trim: a new multifunction steering wheel; redesigned air vent controls; piano black accents on the center console and around the gear shift lever; new chrome accents around the dual-zone Climatronic® control; ambient lighting; and new fabric colors and designs for the seats. Available technologies include Blind Spot Detection plus rear cross-traffic alert and frontal collision warning, as well as Bi-Xenon headlights with Adaptive Front-lighting System (AFS), turn signal, and LED Daytime Running Lights. Blind Spot Detection. Blind Spot Detection utilizes a flashing symbol in the outer area of the side mirrors to make the driver aware of vehicles in the blind spot next to the Jetta or approaching from the rear. This is intended to help improve driver awareness when changing lanes. The system uses radar sensors to "monitor" a space around the vehicle with a range of approximately 65 feet. Customers who choose the Blind Spot Detection option automatically get the rear cross-traffic alert assistance system as well. Rear cross-traffic alert. The new rear cross-traffic alert assistance system is offered in tandem with Blind Spot Detection. The system not only helps alert the driver to stationary and moving vehicles directly behind the vehicle; it also detects vehicles approaching from the side which may be difficult for the driver to see. The radar-based sensor module can even detect objects up to 65 feet away. In case of an impending collision, the system gives an acoustic warning. Frontal collision warning. The frontal collision warning system uses radar sensors to continually monitor the distance to traffic ahead of the vehicle. Within physical system limits, frontal collision warning warns the driver of critical front-end collision situations, both acoustically and visually by a clear warning symbol in the instrument cluster. The radar sensor acquires both the position of stationary cars and motorcycles and those moving in the same direction as the vehicle. The sensor is hidden behind the VW logo on the radiator grille. Bi-Xenon headlights. Bi-Xenon headlights with LED daytime running lights are now available. Also integrated in the new generation of headlights is what is referred to as the Advanced Front-lighting System (AFS). In this system, the headlights track the steering angle and can be turned up to 15 degrees, illuminating corners in turns. Improved efficiency. 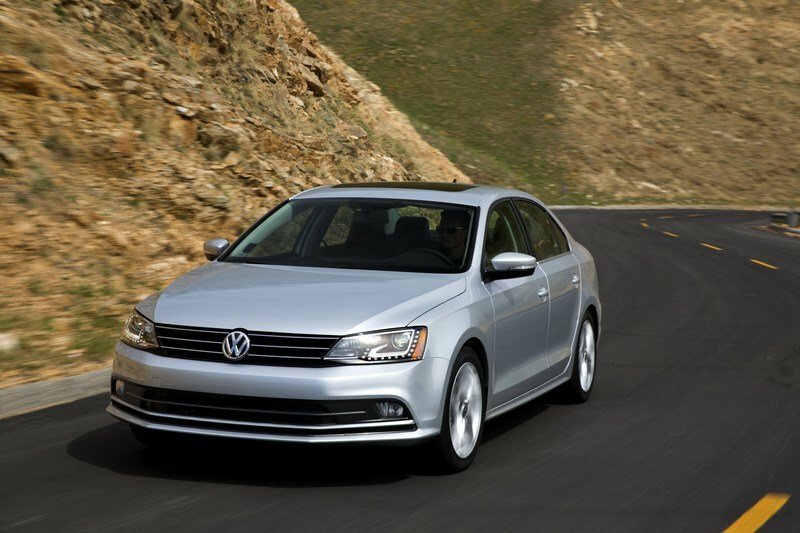 The 2.0-liter 150-horsepower EA288 TDI® Clean Diesel engine offered in the 2015 Jetta is one of the most fuel-efficient engines in its class and already conforms to the upcoming LEV3 emissions standard in the USA. Compared to the previous engine, the efficiency of this new generation TDI was improved by another eight percent. In city driving, the Jetta TDI Clean Diesel with a manual transmission delivers a manufacturer-estimated 32 city/45 highway mpg; its combined fuel economy is projected to be around 37 mpg. Torque-strong. The common-rail direct-injection engine with two balancer shafts is an exceptionally comfortable and dynamic engine. 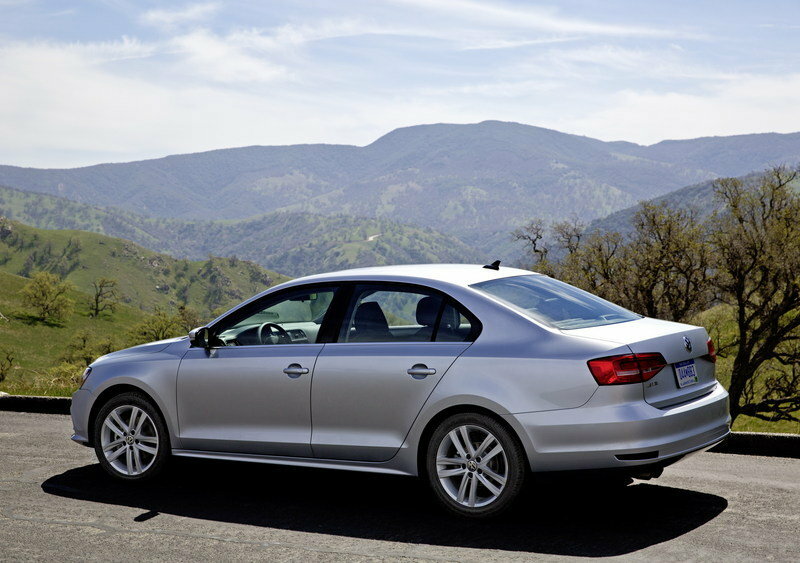 The 2.0 TDI Clean Diesel engine in the Jetta develops its maximum power over a low speed range of 3500 to 4000 rpm. The maximum torque of 236 pound-feet is available from just1750 rpm up to 3000 rpm. First new-generation MDB in the U.S. The TDI Clean Diesel engine in the Jetta is the first engine to be introduced to the U.S. which utilizes the new modular diesel system (MDB) from Volkswagen. Many components of the MDB engines are used in a modular way, such as the exhaust system components and the injection system, turbocharging systems, and forced induction cooling within the intake manifold module. Besides helping to reduce emissions, Volkswagen also designed the new TDI engine for minimal internal friction, for instance using piston rings with lower pretension and very low-friction camshaft bearings. Energy efficiency has also been optimized by using an oil pump with volumetric control and two pressure levels. An innovative thermal management system makes use of separate coolant loops for the cylinder head and the crankcase during the warm-up phase and has a water pump that can be deactivated. First Jetta to have SCR catalytic converter. A complex exhaust gas recirculation system is also used. To conform to the current BIN5-ULEV2 emissions standard in the U.S., as well as the future LEV3/TIER3 standard, the Jetta is equipped with an emissions control system, including Selective Catalytic Reduction (SCR) system that is located near the engine. This layout enables extremely fast response by the oxidation catalytic converter and the SCR catalytic converter. The SCR catalytic converter significantly reduces oxides of nitrogen (NOx) using the additive AdBlue® additive. Compared to the NOx storage catalytic converter (NSC) of the previous model, the use of the SCR catalytic converter not only further reduces emissions, but also improves fuel economy.